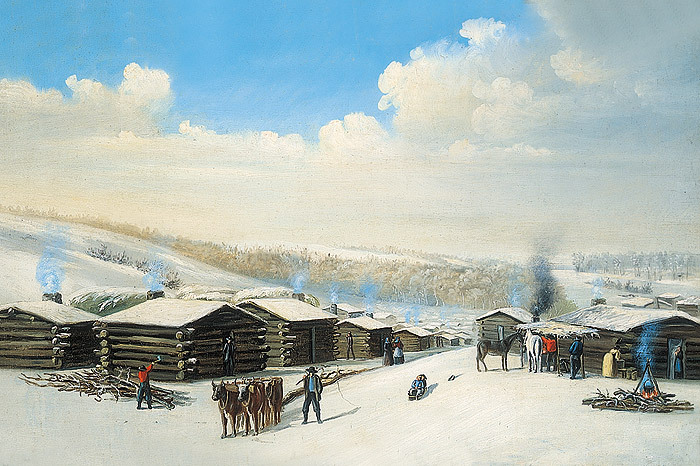 Cover image: “Winter Quarters”, 1846–47. Trees, grass and grave markers of Pioneer Cemetery on the hill at Winter Quarters adjoin the Temple. Though there are many old headstones here, there is poignancy in the fact that all of the graves of the more than 600 Saints who died here are unmarked. With husbands and brothers gone in the Mormon Battalion or off in Missouri on trading or working trips, there would be a glaring absence. A census taken at the end of 1846 revealed a population of 3,483, only 500 of them men. Many thousands more were spread from Council Bluffs eastward across Iowa. Those men who were left carried a heavy burden to help feed the people. Brigham called to his followers, “Unite with us in the principles of self-preservation,”(2)and the people did, sacrificing personally for the welfare of the community. That January in a room of Heber C. Kimball’s log house, Brigham Young received a revelation that would become section 136 of the Doctrine and Covenants. In that revelation, the Lord gave the pattern for the exodus. The companies were to be organized with captains of hundreds, captains of fifties, and captains of tens. They were to select an advance pioneer company to leave for the West in the spring with teams, seeds, and farming utensils: this company would put in spring crops in their new place of refuge. Each company was to bear in equal proportion, according to the dividend of their property, the poor, the widows, the fatherless, and the families of those who had gone into the army. The Saints were also to prepare houses and fields for those who would be left behind. All these things were to be done with a covenant to walk in all the ordinances of the Lord. The promise for those who would obey was clear: “Go thy way and do as I have told you, and fear not thine enemies, for they shall not have power to stop my work. Zion shall be redeemed in mine own due time.”(8) As winter melted into spring, the citizens of Winter Quarters, Council Bluffs, and a string of temporary settlements across Iowa began casting their eyes west toward the setting sun. None of these towns was meant to be a permanent resting place. Brigham Young wanted a mountain range between the Mormons and their old enemies. Those who had endured the winter with their faith intact were as tested and tough as any pioneers who would ever head west. The limits of their faith had been tried and not been found wanting. 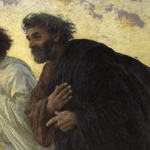 This was a very timely article as we are preparing to take our stake priests and laurels there this weekend. Thank you! Thank you so much for sharing this today. I needed to be reminded of God's Hand being in all things ...especially when we suffer. Those pioneers are Home now with the Father and Savior they loved and lived for while here on the earth!